The Maine Democratic Party is the affiliate of the Democratic Party in the U.S. state of Maine. For much of the time after the Civil War, the Democrats were a minor player in a political scene dominated by the Republican Party. 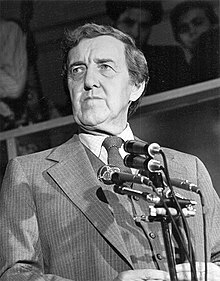 However, during the 1950s, Edmund Muskie led an expansive political insurgency culminating in his election as Governor of Maine and successive Democratic elections to both state and national offices. From 2012 to 2019, despite having a Republican Governor in Paul LePage, the party remained strong, holding key offices in the state government and U.S. Congress and maintaining a majority in the Maine House of Representatives for 6 of LePage's 8 years. The organizational structure of the party consists of party staff and party officers along with the house and senate. There are also several committees that are also involved in the Maine Democratic Party. The party in Maine has several goals they promote, which are laid out in the Democratic Party Platform. The Maine Democratic Party controls the Governor's office. They are the majority party in the Maine House of Representatives and the Maine Senate, which together selected the Attorney General, State Treasurer, and Secretary of State. They also hold both of the state's US House seats. While they do not hold any US Senate seats, independent Senator Angus King caucuses with Senate Democrats. The last Democratic US Senator from Maine was George J. Mitchell, who was serving as Senate Majority Leader at the time of his retirement in 1995. The Maine Democratic Party was revitalized by Edmund Muskie during the 1950s and 1960s. Muskie served as Governor, Senator and finally Secretary of State under President Jimmy Carter. The Democratic Party has history dating back to the 1800s. Maine entered the Union in 1820 as an Anti-Federalist state. Soon after, in 1834, the Anti-Federalists adopted the Democratic Party name. The Democrats had limited success for nearly a hundred years, in part due to slavery. The Northeast was predominantly anti-slavery whereas the South was pro-slavery. When the Whig party split in 1856, most of its northern wing formed the Republican Party, which dominated Maine due to its anti-slavery stance. Maine was predominantly Republican until 1954. In 1954, in a gubernatorial election, Democratic state representative Edmund Muskie became only the fourth Democrat to win the governorship in the 20th century. He won the state over in part due to his stance on economic growth through industrial development, accessible politics on television and being acceptable to diverse population growth. Between 1954 and 1974, the number of registered Democrats more than doubled from 99,000 to 212,000. In more recent years, Maine has been roughly evenly split between Democrats, Republicans, and independents. For instance in 1990, independent registered voters constituted 37% of the electorate, Democrats 33%, and Republicans 30%. This is a great contrast to the first hundred years of Maine politics. The Maine Democratic Party goals are to promote economic security, opportunities, health care, education, ethical government, freedom, safety and national security. Maine Democrats are also in support of civil rights, clean environment, global peace and security. These are the issues and guidelines the Maine Democratic elected officials base their political work around while serving the people of the state of Maine. The platform ensures economic security through a government run social security program. Extensive regulation of public and private pensions and secured protection of worker pension funds. Maine Democrats' promote fair workplace opportunities and promise workers of Maine the right to form unions through the Employee Free Choice Act, which gives employees' the chance to strike without being punished by employers and also keeps the workplace free of hazards, harassment, discrimination, etc. The Party Platform promotes nationalized health care, which is provided by the government and until this goal is reached they believe each state should develop their own health care system at the state level. The platform notes education as extremely important. They believe in, investing in educational institutions, and promoting lifelong learning. The platform also supports environmental protection through an energy plan to curb pollution and increase productivity. As noted in the Party Platform of the state of Maine, these are some of the principles and values the Democrats pledge to work on with local governments, and other states to ensure a better future for the state. The Ideology associated with the Maine Democrats can be classified as American Liberalism and Progressivism. Typically most Democrats are classified in these two ideologies. The focal point of present-day liberalism in Maine includes issues such as, voting rights for all adult citizens, equal rights, protection of the environment, and the provision by the government of social services such as, equal education opportunities, access to health care, transportation infrastructure, and help for those in serious poverty. For example, food and shelter. All of these principles and issues were a main focus on the 2010 Maine Party Platform. Progressivism is an ideology that stresses social, political and economic reforms. Progressives typically advocate reforms in areas such as, education, health care, political affairs, etc. For example, health care reform is progressive. From the traditional system to the universal single-payer system on the national level. The progressives want the reform. In Maine's Party Platform they advocate to stand by the single-payer health care system on the national level, which increasingly labels them part of the Progressivism ideology. The Maine Democratic Party is governed by the Democratic State Committee. ^ a b c "1946-1970 A Different Place". Maine History Online. Retrieved 2018-02-20. ^ a b Palmer, Kenneth T.; Taylor, G. Thomas (1992). Maine Politics & Government. U of Nebraska Press. ISBN 0803287186. ^ Blomquist, Robert (1999). "What is Past is Prologue: Senator Edmund S. Muskie's Environmental Policymaking Roots as Governor of Maine, 1955-58". Valparaiso University. ^ Stevens,John. Abbott, Cabot. Elwell,Edward Henry (1892). The history of Maine. Portland:Brown Thurston Co.
^ "Maine Democratic Headquarters", October 30, 2011.